The pound has been on a rollercoaster ride over recent weeks, with steady gains against the euro and US dollar giving way to heavy losses due to Brexit anxieties. Overall, the GBP/EUR exchange rate has remained at €1.11 over the previous fortnight. The pairing rose to €1.12, but lost this on a fresh Brexit scare. 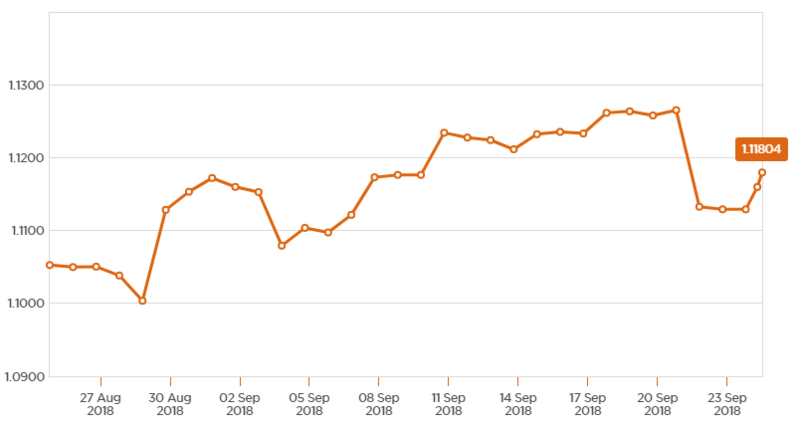 The situation has been better in the US, with the GBP/USD exchange rate rising from $1.29 to $1.31; as with the GBP/EUR rate, the pound hit a temporary high of $1.32. Brexit has been in the spotlight over the past couple of weeks, with optimism and pessimism about the UK’s exit from the EU causing pound gains and losses against the euro and US dollar. Hopes (and the pound) initially rose when EU Chief Negotiator Michel Barnier suggested concluding Brexit talks by November. The gloss came off and the pound fell after an EU summit in Salzburg, however, as Theresa May’s ‘Chequers plan’ for Brexit was rejected by EU leaders. The euro fell against the pound due to slowing Eurozone inflation and continued caution from the European Central Bank (ECB), before rising after the Salzburg summit. For US dollar traders, the increasingly acrimonious US-China trading relationship hit the headlines with both nations introducing new tariffs against each other. The US dollar fluctuated against the pound as economists speculated about the potential damage done to US consumers and businesses. The next two weeks will have limited pound-influencing news – the next major UK data will be this Friday’s GDP stats. These might boost demand for pound sterling, should they show a forecast-matching acceleration in economic growth levels. Beyond this, next week’s UK PMI figures could also affect the pound – a services sector slowdown might devalue Sterling. The next high-impact Eurozone data will be Friday’s inflation rate estimates – these could raise euro demand if they show a forecast-matching rise. Further ahead, next Monday’s Eurozone unemployment rate reading might push the euro higher against the pound if it shows a surprise reduction. Upcoming US news includes this Wednesday’s Federal Reserve interest rate decision – Fed officials might boost the dollar if they hike interest rates from 2% to 2.25%. The US dollar could also rise against the pound on next Friday’s jobs market data, which is expected to show a lower unemployment rate.